While there seems to be an abundance of acne face products, there really isn't much out there for your body. Over the years I've searched high and low for products to sort out problematic areas and only recently have I came across a product intended for this purpose. 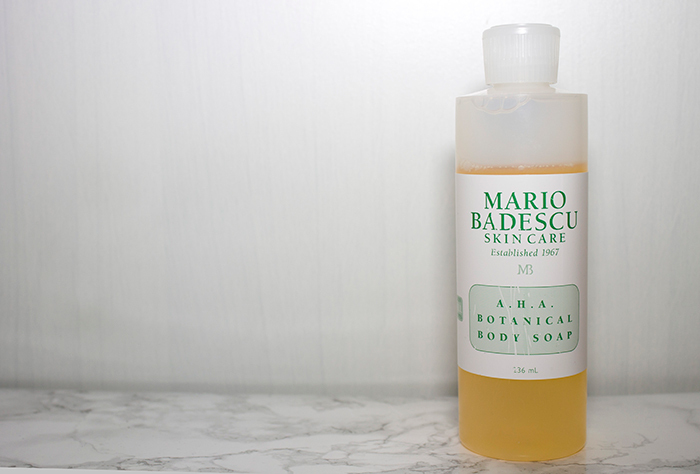 For the past month I've put the Mario Badescu AHA Botanical Body Soap to the test to see if it could make a difference. Here's what I've found. In the past I've found Mario Badescu handle acne related products really well so I had very high hopes for this stuff. The body soap comes in a 236ml bottle, containing a lightly scented gel soap containing fruit extracts to gently exfoliate the skin, removing dead skin cells. It doesn't sting in the slightest so even sensitive skin can use this. A little does go a long way with this stuff so you really don't need a lot. What I like to do is apply a few drops to a cellulose sponge and gently go over my problematic areas. It does foam up quite a bit so you can reach quite a lot of areas with very little product. Usually with AHA products you experience some tingling but I didn't experience that while using it. From the first use I could tell a difference in the texture of my skin. It instantly felt smoother and soft to touch so the results were so far so good. As for the appearance of my problematic areas, this was more of a gradual process. After using it the first week, I noticed that my skin looked a little worse. However, this was basically due to the exfoliation process. It basically works by bringing things to the surface then over time helps clear up all the little bumps and redness. After a month's use, I have noticed a real difference but I still have a long way to go. I think with continued use and patience my skin will be clear in no time thanks to this. If you're having a bad time with body acne I'd definitely recommend giving this a go. You can pick this up from Beauty Bay for £7.95 which I think is a very reasonable price!